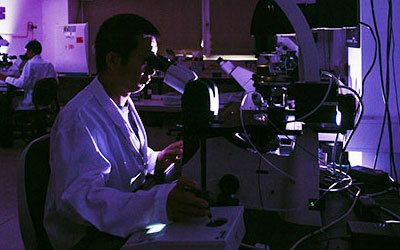 Design precise, translatable, genetically-engineered animal models for preclinical research and drug discovery. PhD Scientific Program Managers individually supervise each project to support your research goals. Taconic's geneticists, embryologists, molecular biologists, and preclinical scientists are on hand to consult on each stage of the process. Taconic's extensive experience in outsourced, in vivo project management assures on-time, on-budget delivery of your animal model. All animal operations are overseen by board-certified veterinarians and the standing Institutional Animal Care and Use Committee (IACUC). Taconic is the most experienced rodent model design company in the industry, with a sixty-five year record of consistent quality and innovation. Each custom model design project develops along an agile framework, letting you reassess and retarget your model fluidly as new data becomes available. You can pause or postpone projects at any time, or even "back up" project milestones via cryopreservation. Gain critical insights into basic gene function and explore pathogenesis and drug development with conditional and constitutive knockout mice. Taconic designs, breeds, and validates knock-in mouse models for translational research, enabling researchers to analyze gene expression, identify regulatory elements, and model disease in humanized mice. Taconic has successfully completed over 315 genetic humanization projects within the last ten years. Design and generate study-ready cohorts of transgenic mice to study transgene expression and function in specific physiological processes. Targeted, conditional, and random transgene expression options available. Gain precise control over in vivo gene expression in knockdown mice with RNA interference and inducible/reversible miRNA expression. Taconic was the first company to commercialize in vivo knockdown, in 2007, and has more institutional experience with knockdown mouse generation than any comparable vendor. Taconic is a fully-licensed provider of genetically-engineered animal model generation services, able to partner with you at any stage of the model design process. Use the latest CRISPR/Cas9 gene editing technology to generate precise, translatable research models with a 100% success rate. Taconic Biosciences was the first vendor to utilize CRISPR in both mice and rats, and is the first commercial custom animal model developer to hold licenses from both the Broad Institute and the UC Berkley. In 2017, Taconic licensed additional CRISPR technologies from ERS Genomics to complement Taconic's existing Broad License. Taconic's exclusive ExpressMODEL® cohort expansion program saves months off of overall project timelines, taking your genetic modification from vector construction to a homozygous cohort in as little as fifty four weeks. Licensing and usage rights for Taconic's genetically engineered animal models are adjusted to the needs of your institution. Learn how the ability to design targeted animal models can accelerate project timelines in your area of application. 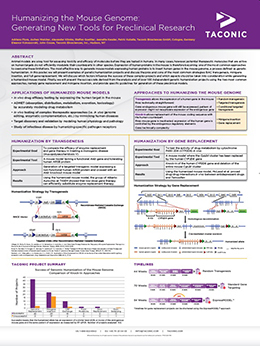 In this poster, we will present examples of genetic humanization projects and discuss the pros and cons of the most common strategies: BAC transgenesis, minigene insertion, and full gene replacement. We will present the success rate derived from the analysis and of over 100 independent genetic humanization projects using the two most common approaches, namely gene replacement and minigene insertion, and provide specific guidelines for generation of these preclinical models.